I’m late to this conversation, but the fallout from the last five years of politics still haunts me, so I don’t think it’s overly strange that I’m adding my two cents here at this point. I was raised in a very un-Christian home — we practiced the Golden Rule & pretty much let people worry about themselves so long as no harm came to others. Now I’m “all growed up” (haha) & while my family has found Christ, I’m still a peaceful skeptic. My family has become exceptionally vitriolic though, & it’s created quite a divide. I’m the black sheep, liberal, far-left atheist… versus a whole crew of supposedly pristine, conservative, far-right Christians. And I don’t know at all how to bridge the huge gap that has developed between us. My parents & I are somewhat at odds, but mostly try to pretend nothing is wrong between us, since there is just no talking things out. They think what they think, I think what I think, & there the situation lies for all eternity. My sister is no longer speaking to me. And many of my distant relatives & oldest friends have completely disengaged from any form of conversation with me. Part of me is relieved, because if they all left ME, then it means I don’t have to be bothered with their rhetoric. Another part of me is heartbroken, because of course no one likes being cut off. Yet a third part is angry and bitter, because to me, that’s not how the Golden Rule (much less Christianity!) should work. We should be able to come together & meet in the middle, but somehow it just doesn’t seem possible. Andi-Roo, Sorry that I didn’t see your comment before now. Thanks for stopping by and reading and commenting. I certainly couldn’t blame you if you tried to write off all Christians after the way you have been treated in the name of Christianity but I appreciate that you realize that some of us are kinder and gentler. 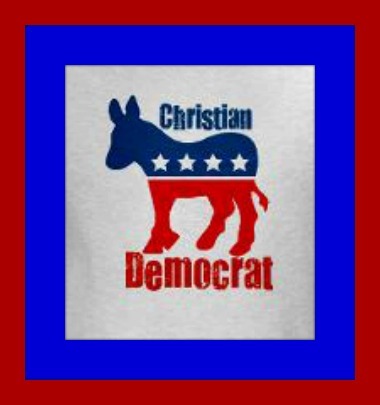 Doesn’t the fact that people of all political political pursuasions can can make God and the Bible fit with their outlook suggest that politics must be determined on rational argument not on appeal to religion? Ian – it is hard to argue with your statement and so I won’t. However, I will say that most of us (if not all) are incapable of applying logic that is not colored by our own perspective to some degree. One of the illusions of modernity is the notion that one’s values and one’s personal identity can be separated, or that “religion” can be separated from life. There is not space in a blog comment to explain this fully, but I have posted something on this very point on my blog here Religion, spirituality and politics | Khanya. I do not accept that modernity as such necessarily separates values and identity. Your religion may be the superordinate construct under which other categories are subsumed but that its not the case for everyone and, whether in modernity or postmodernity, religious statements are not transparently meaningful – you have to argue your case. I can understand the student you cite in your blog who wanted a more inclusive poster than ‘Jesus is our King, not Vorster’ for the anti-apartheid purposes you describe. The poster, whilst meaningful to you, would alienate Muslims, republicans as well as non-religious persons and we have to ask – what does it mean? Does it mean every political leader must be subservient to Jesus? If so, to which Jesus are we referring? is it asking for monarchy rather than democracy in the new South Africa etc etc? These questions can’t be settled by religion only by dialogue and debate – we may bring religious categories into the debate but only by owning and explaining them. Jesus is King is your opinion which you have to explain and validate if others are to make any sense of it. We have to know which language game you are playing. Obama has won the election, is not the same language category as Jesus has been raised from the dead, or Jesus is Lord. The medieval mystic Meister Eckhart said, “To use God is to kill him”. I believe that applies whatever our political outlook or ideology. Rhonda – I know what you mean about using the label “Christian”. I don’t usually use it but thought it was needed in this post to get my point across. I typically identify as a follower of Christ. I really appreciated this. Thanks so much.